Allegra Boverman/Gloucester Daily Times. 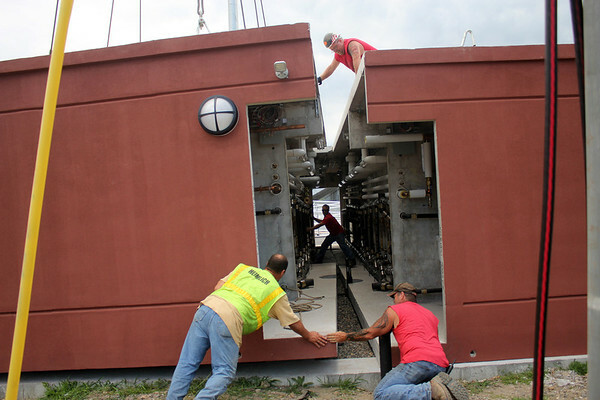 Crews from several companies installed the new bathrooms at Newell Stadium on Thursday. The building came prefabricated in four large cement pieces from Connecticut. From left, in front, are Michael Dabrieo, foreman of Heimlich Heimlich Brothers Corporation, Wally Rich of Locke, and, inside, Keith Morrell of Locke, the crane working on the project, and top, John Parker of United Concrete Products working to set the fourth piece in place.